Hurricane Michael made landfall in Mexico Beach, Florida as a high-end Category 4 storm early Wednesday afternoon — the strongest such storm on record to hit the Florida Panhandle and one of the strongest ever to strike the continental U.S.
Why it matters: This storm has caused catastrophic damage in parts of the Florida Panhandle where the core of the storm first moved ashore. Hurricane Michael will continue to cause damage overnight as it moves through Georgia and into South Carolina, with hundreds of thousands likely losing power. The storm has set milestones even as it moved further inland, becoming the first Category 3 storm to hit Georgia in 120 years (and doing so after it passed through another state, no less). Damage reports so far are widespread and severe, particularly in Mexico Beach, Florida, where the eye first came ashore, as well as Panama City, Florida. Even veteran storm chasers who have been inside the world's most powerful storms have been stunned at the damage. Damage will extend well inland into Georgia and the Carolinas, as weakening is only slowly occurring. Tree and power line damage will be extensive, and could occur all the way into portions of North Carolina. Tropical storm warnings have been issued all the way to the Atlantic coast of North Carolina, as Hurricane Michael is expected to remain a formidable storm for days. Millions will be without power by Thursday morning, and some may not see electricity restored for weeks. The big picture: Hurricane Michael ranks in the top 3 hurricanes of all time to make landfall in anywhere in the continental U.S., in terms of its minimum central air pressure at landfall, which was 919 millibars. By this metric, it was stronger than Hurricane Andrew and Hurricane Katrina. According to hurricane expert Philip Klotzbach, only two other hurricanes have made landfall in the U.S. with a lower atmospheric pressure than Hurricane Michael (in general, the lower the pressure, the stronger the storm). Regarding the storm's 155-mile-per-hour sustained winds at landfall, no prior hurricane has hit the Florida Panhandle with winds as strong as Hurricane Michael. 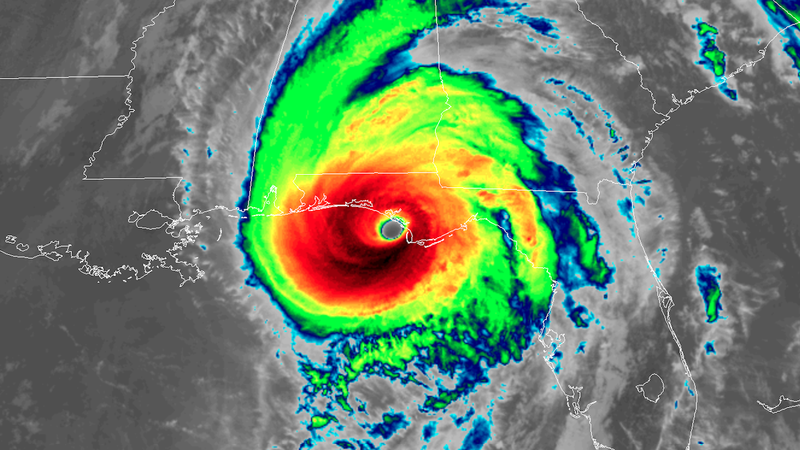 Between the lines: Overnight on Tuesday and into Wednesday morning, Hurricane Michael underwent a period of explosive intensification that was not explicitly forecast by any computer models or human forecasters. In just a few hours on Tuesday night, Hurricane Michael developed the classic "look" of a devastating Category 4 or 5 storm, with a clearly defined eye surrounded by towering thunderstorms extending high into the atmosphere. Our thought bubble: Hurricane Michael illustrates a scenario that meteorologists have worried about for years — a rapidly intensifying hurricane moving toward the coast at a steady clip, giving coastal residents precious little time to prepare. Many people may not have evacuated when seeing the storm as just a Category 2 storm earlier on Tuesday. However, by the time the storm reached its fearsome peak, it was too late.